Gold has had a good run. Which gold stocks are the right ones to consider today? Gold prices started 2016 at around $1,075 an ounce. More recently they've traded hands at over $1,300 an ounce. That's a big gain that's helped push the value of gold-related companies higher. For example, Barrick Gold (NYSE:GOLD) is up more than 180% so far this year. It's still one of the top three gold stocks to look at, but the price increase paints a clear image of an industry that has quickly regained investor favor and perhaps deserves a little caution going forward. Barrick Gold's main operations are in the Americas, Africa, and Oceania. However, what sets it apart is its collection of mines in Nevada. These mines are close together, offering economies of scale, and are in a politically stable country. These core assets have very low all-in sustaining costs -- the amount of money it costs to pull an ounce of gold out of the ground. To give you an idea of how low, Barrick's all-in sustaining costs were about $830 an ounce last year. That puts it at about the 40th percentile on the gold-cost curve. Not bad. It's best mines, however, sit at about the 15th percentile, with all-in sustaining costs of around $660 an ounce. Its goal over the next few years is to push its overall costs as low as $725 an ounce by trimming production a little and focusing more on its best mines. Why does this matter? Two reasons. First, if gold continues to rally, or at least remains at around current levels, lowering costs should lead to greater profits. Watch the second-quarter results for signs of higher gold prices that are starting to support top- and bottom-line results. Second, and perhaps pessimistically, if gold falters, Barrick continues to work toward an industry cost leadership position. That will protect the top and bottom lines if everything doesn't go as planned. The next gold stock to look at is Royal Gold (NASDAQ:RGLD) , which is not a miner but a royalty and streaming company. Royal Gold gives upfront cash payments to miners in exchange for the right to buy low-priced gold and silver in the future. The miners like this approach because it allows them to avoid issuing shares, selling bonds, or taking bank loans to fund growth projects, which can all be costly financing options even in the best of times. Royal Gold likes these deals because it locks in access to low-cost gold and silver. The numbers are pretty compelling. If you divide the carrying value of the company's assets (its streaming and royalty agreements) by its ounces of reserves (how much gold it expects to buy in the future), you get a figure of around $450 an ounce. That leaves a lot of room for profits if gold heads higher and plenty of protection if gold should cool off. You might note that Royal Gold lost money in its fiscal third quarter. That was driven by asset writedowns for investments in mines that didn't work out as planned. That's clearly a bad thing, but the past year or so it's been able to ink deals that have materially increased its "production." In fact, operating cash flow increased nearly 30% sequentially over the fiscal second quarter as new agreements came online and reserves expanded around 20%. 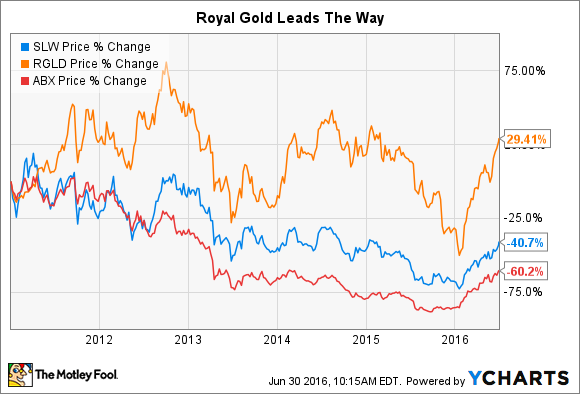 Royal Gold's business model allowed it to avoid some of the pain that miners felt during the commodity downturn that started back in 2011. So it may not have as much upside, but it could be worth giving up some potential gains for the security of knowing Royal Gold should be able to keep making money if gold prices falter. Note, too, that it's increased its dividend annually for the past 15 years -- an impressive feat and a statement to the business model's strength, given that gold had been in the doldrums for so long. Another streaming company that you might want to consider is Silver Wheaton (NYSE:SLW). It shares many of the same characteristics as Royal Gold, including very low costs. Silver Wheaton's average cost for gold is around $400 an ounce and $4 for an ounce of silver, which makes up 60% of its "production." Silver Wheaton shares, however, haven't performed as well as Royal Gold's shares. Right now some of that performance has to do with a tax dispute between Silver Wheaton and the Canadian government. To sum it up, Canada says Silver Wheaton isn't accounting for its revenue properly and owes back taxes, interest, and penalties. Using back-of-the-envelope math, the bill looks as if it could be around $400 million, but that could go higher if more tax years get examined. That's a lot of money for Silver Wheaton, which ended the first quarter with around $90 million of cash. Still, it had $700 million left on a revolving credit facility and was able to tap the capital markets via a stock sale, raising around $600 million that it used to reduce the outstanding balance on its credit facility, further increasing its capacity. So there's money that can be used to pay Canada off in the worst-case scenario. However, any tax changes could reduce earnings going forward. But based on the relative performance compared with Royal Gold, it looks as if a lot of the negative here is already being priced in to Silver Wheaton's shares. If Silver Wheaton wins the case, on the other hand, investors are likely to look more favorably on the shares, perhaps closing the performance gap with Royal Gold. Silver Wheaton, then, is more appropriate for investors capable of handling some uncertainty in exchange for more potential upside. If you're looking at gold stocks, one of the largest and lowest-cost miners is Barrick Gold, which is why it's one of the three top gold stocks to buy now. That said, Royal Gold and Silver Wheaton both offer a different take on the space, with low costs built into their business models. Thus, all three should provide a nice mix of upside potential if gold keeps pushing higher and downside protection via low operating costs should gold falter.